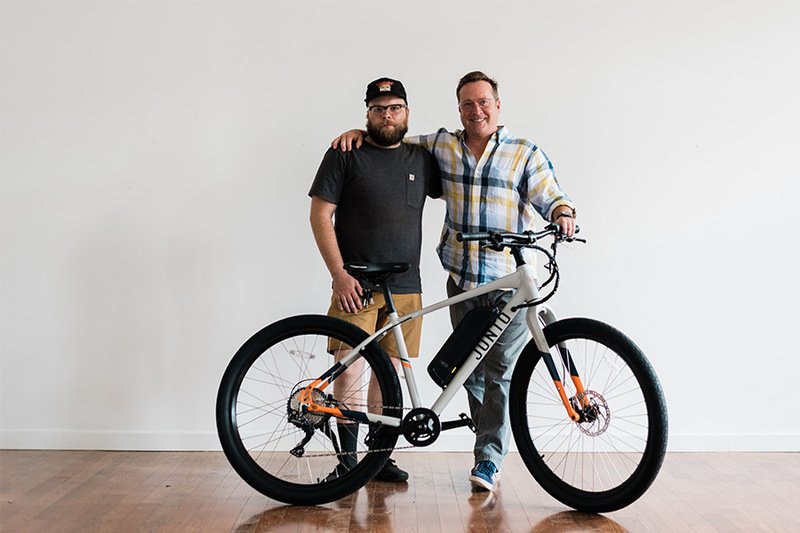 An interview with Brian Powell, co-founder of Junto Bikes, a Philadelphia based startup that is looking to change the way we commute, swapping our cars for their durable city-tested electric bikes that can get you from A to B with no sweat. Brian Powell isn’t new to the startup lifestyle. After building a few successful organic food brands from nothing, he is at it again, but this time in a completely new category: electric bikes. It’s new territory for Brian, in a product category that hasn’t hit the mainstream yet. Brian and his team have successfully launched a high-quality electric bike model, have some early sales to speak of and very positive customer reviews, but fundraising hasn’t been a walk in the park. 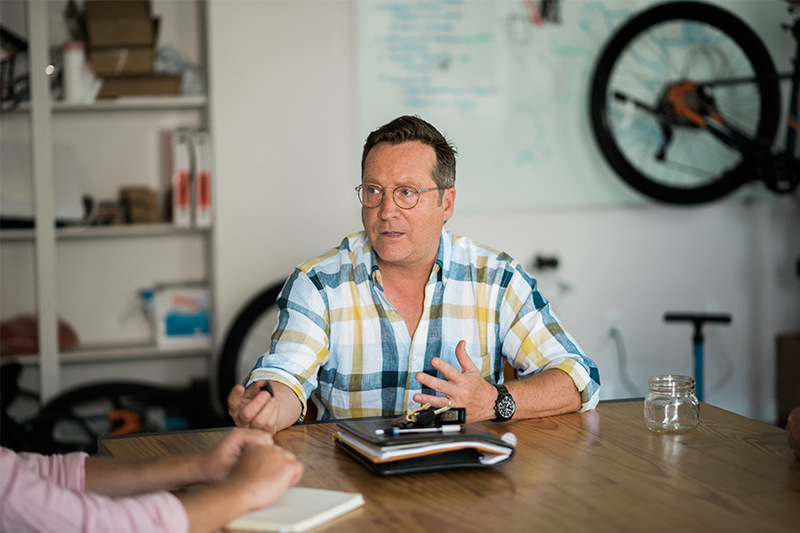 Investors are full of curiosity but are hanging back a bit, waiting to see who else is willing to dip their toe in and more clarity on where the electric bike market is heading in general. The fundraising grind is something Brian is used to and fully embraces. When I ask him how things are going, he emphasizes that he’s been here many times before and that he loves the challenge. This isn’t just him keeping face, either, he really enjoys being what he often refers to as the “canary in the coal mine.” Some people thrive in this environment and Brian is definitely one of them. The truth is, Brian has found a sweet spot, riding out to give test rides to interested parties, talking about his labor of love and feeding off of the energy and excitement of others. Seeing how well the test ride functions as a catalyst for the sales process (converting to sales at a 40% clip), the challenge now is finding ways to scale the test ride success nationally. Brian and Simon have built other successful brands together in the natural and organic food space and joined forces again for Junto. In a nutshell, Brian provides the vision and Simon handles the operations. Most people don’t know what an electric bike is and have never ridden one before, so there is a pretty steep learning curve. Education is key. 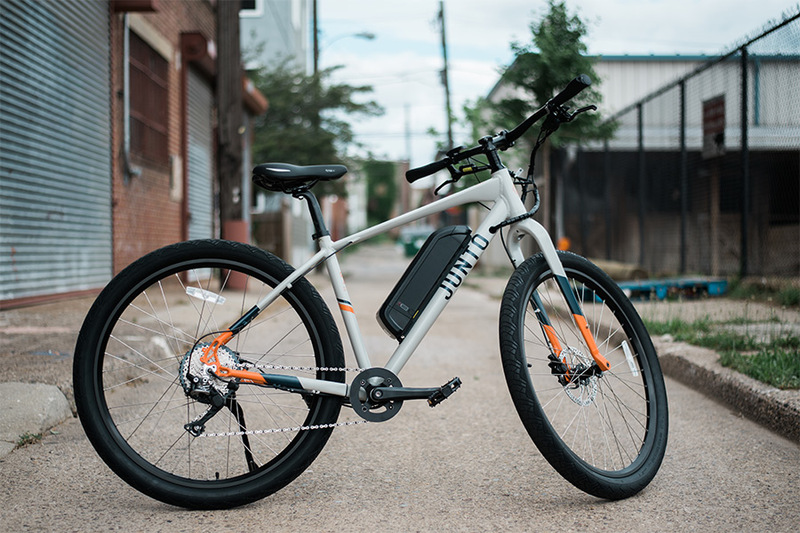 350W motor, 29” wheels, lightweight aluminum frame (see full Junto specs), gets you 50-60 miles without recharging the battery. Junto is currently raising a pre-seed round and is going through due diligence with a lead, strategic investor (as of Nov 1, 2018). Aside from selling a product that is mostly unknown to buyers, raising funding hasn’t been a walk in the park for Brian and Simon. Knowledge of electric bikes is certainly trending up but the category is far from mainstream. The electric scooter craze of late, seen in the massive explosion of VC backed startups like Lime and Bird, has fueled curiosity for electric transportation in general, but it’s also created a lot of noise across the space. Junto is not a “last mile” solution like some of these electric scooter brands that have grabbed the spotlight of late. 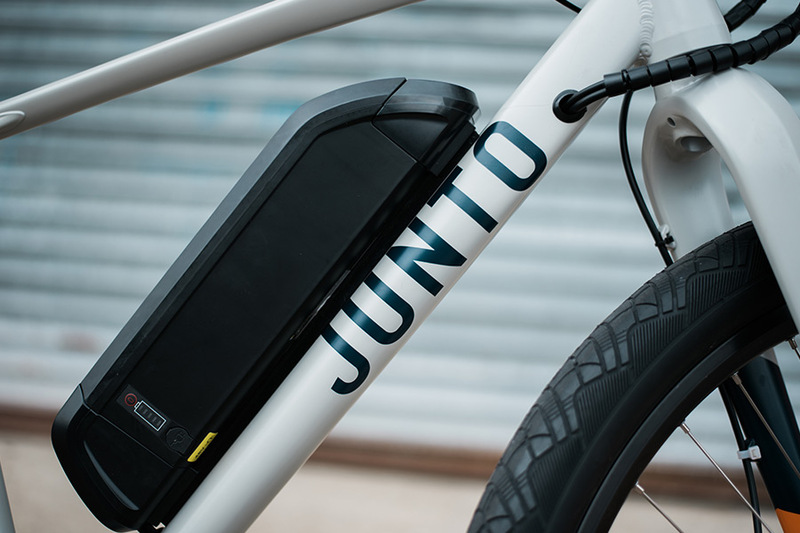 Junto is an A to B solution, where you can easily travel 3, 5, or 13 miles, using as much or as little of the bike’s pedal assist function as you want or need. It comes down to getting the right message across about how an electric bike can improve a person’s life, and then getting them to ride a Junto and feel it for themselves. With the electric bike market, I see a lot of similarities to the mattress in a box space in its early days. There is no clear front-runner – no big name brand like Casper that has sprinted past everyone in the space by spending massive VC dollars on marketing and advertising. 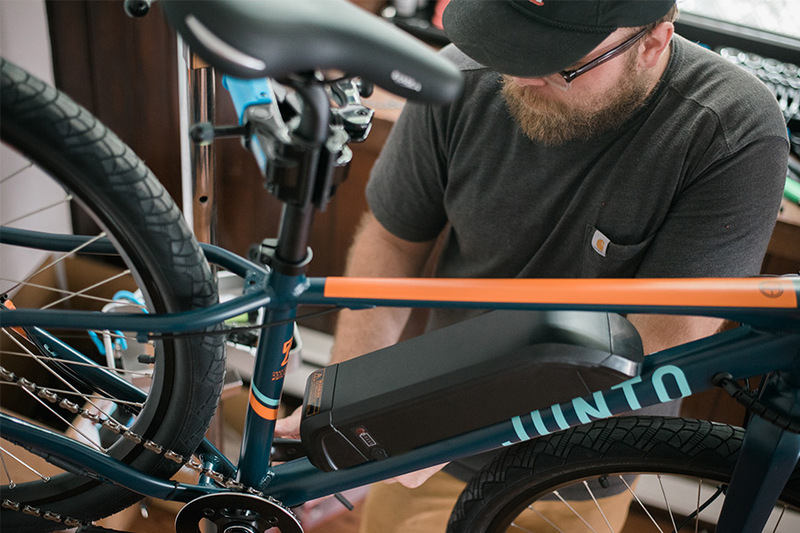 The time is coming for electric bikes, and Junto wants to carve out their piece of the pie. One of the biggest factors for Junto’s success will be how well it differentiates its product from the competition. This is something that I knew needed to be clarified from the moment I connected with Brian and his team. There are plenty of competitors in the electric bike space, and many are low cost, low-quality brands that pull the same product from overseas and slap a new logo on it. The result is a lot of junk and plenty of noise for Junto to overcome. As I mention in the podcast, Brolik began working as Junto’s marketing agency and over a period of 4-5 months of collaboration, the possibility of becoming investors in Junto emerged. Seeing the potential in the space, the experience of the founders, and knowing what we could do with a continued effort to optimize their online marketing and drive sales, it just made sense. With any startup, we consider investing in (we don’t do it often) there are certain criteria that we look at. We are not unlike other VCs who play to what they know and what their strengths are. We look for a strong brand and offering that is struggling to gain market share and acquire customers fast enough. This was the case with Junto, and our interests aligned. We recently formalized our interests and Brolik is now an investor in Junto. We’re still debating the name, but the more important point is, the Junto team has phase 2 up their sleeve and it’s not far off on the horizon. Junto’s next model electric bike is a freight bike, built for shorter travel and heavy weight. Think about carrying 100 pounds of groceries from the grocery store to your house, this is the use case for the Lil’ Stinker. It’s a heavy duty bike for carrying up to 300 pounds of cargo. The next model is not far off for Brian and his team, but the focus remains continuing sales of the Junto 1 and raising capital to get the next model off the ground. Brian and Simon are doing what founders do best, navigating the ups and downs of a startup venture, hustling at local neighborhood events, courting investors and taking their punches as more people are saying no than saying yes. 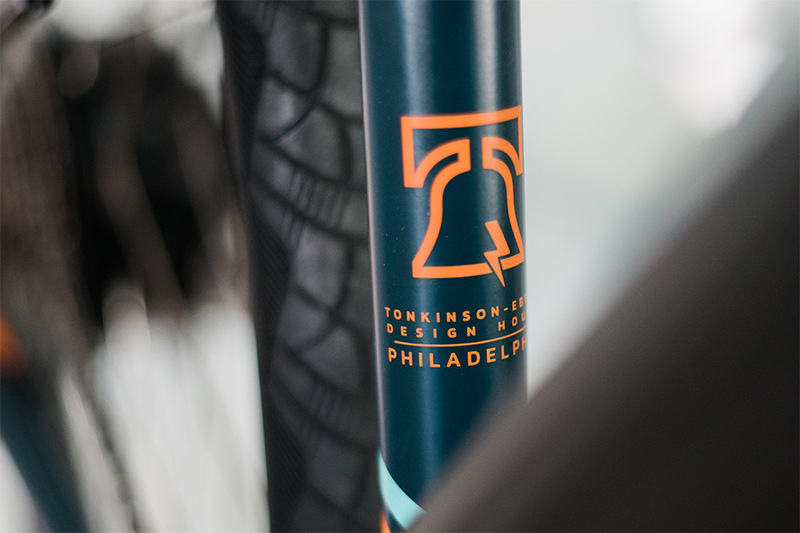 They are deeply invested financially and dedicated mentally to building this hometown bike venture into a nationally known brand. It’s not the first time they’ve been in this position and I am confident it won’t be their last.